Hearts to the Rescue: GOOD NEWS, DUKE HAS BEEN PLACED! DUKE HAS BEEN PLACED AND IS SAFE. WHO AM I? My name is Duke and sadly my family has to move to a place that doesn't allow dogs. I wish I could stay with them, but I know the only way to help them is for me to find a good new home so they won't worry about me. Will you let me come home with you? I'm gentle and will be your loyal companion. 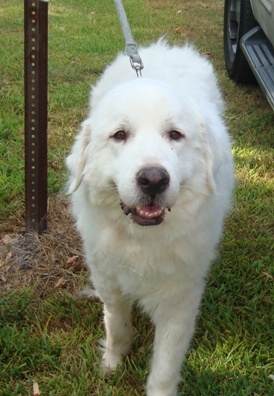 Name: Duke; Dog; Male; Great Pyrenees; Age: 5 y/o; neutered, vaccinations up to date, and housebroken.